An app for iOS, Android and Windows Phone that allowed sharing and exploring of sounds from around the world. 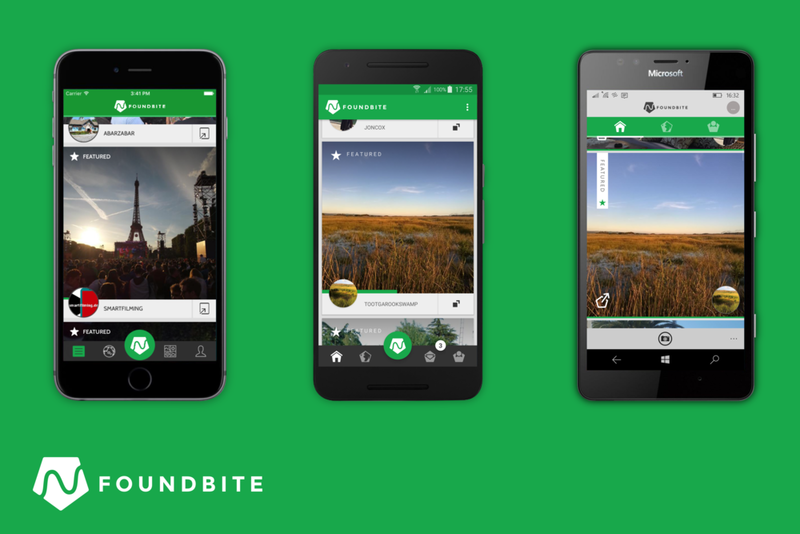 An app for iOS, Android and Windows Phone that allowed users to share and explore the sights and sounds of the world. Sound can trigger memories, ignite the imagination and capture atmosphere in a place or event. It is a powerful and often-overlooked medium. I set up the Foundbite service in 2013 with the aim to encourage people to share and explore experiences with one another using a combination of still photos and sound at a time when phone microphones were beginning to get good enough to record some really high quality audio. The app started life on Windows Phone with funding from Microsoft and Nokia, and over the course of the next few years expanded to iPhone and Android with the help of Sony Mobile and the backing of IdeaLab. Our small team built an app that was downloaded over a quarter of a million times, embraced by a loyal band of followers from all across the world. Users uploaded foundbites covering a range of amazing events including political protests in Ukraine, the Olympics in Brazil and wildlife conservation efforts in Australia (to name a few). After looking at how mobile sharing of video and photos had taken off in 2012, I came up with a concept for a service that enabled users to share the ambient sound of a place or experience. While SoundCloud was popular for sharing music on the web, only a few small companies were focusing on sound sharing for mobile. When an opportunity came to submit the concept for Foundbite to a competition run by Nokia and the creative agency OneDotZero I pulled a few all-nighters and submitted a prototype (with minutes to spare). The demo featured a map of London with various sound recordings and photos overlaid. You could scroll around this map and click to listen to the sound recorded in a given place. I'd chosen to include images after some experimentation, they gave the sound some context, while still allowing the user to focus on the audio and allow their imagination free reign. Despite the rudimentary nature of the prototype, the concept struck a chord with the judges and Foundbite was awarded first prize. In 2013 Nokia announced their AppCampus programme, aiming to create a thriving community of app developers on the youngest mobile platform and to help bring apps to market that would be, for a time, exclusive to Windows Phone. Having never built a database or designed a backend of any kind at this stage any help I could get would come in useful so applied with a course-mate at university course-mate, George Powell. With the Foundbite concept we were selected to be one of the first 20 teams to join the programme. As members of the inaugural batch we received a £16,000 grant, mentoring on-site in Finland for a month and marketing support from Nokia and Microsoft, in exchange for six month's exclusivity to Microsoft’s platform. Following six months of the most intense learning I’d ever done, we launched version 1 of the app into beta in July 2013. A lot of iterations of the product, the core UX and everything in between followed this and version 1 was launched into the Windows Phone store in November 2013. It received some really positive feedback from the community, excited by one of the first social networks exclusively for Windows Phone which had, at that time, been ignored by the likes of Twitter, Vine and Instagram. There's a lot more that can be said about launching on Windows Phone exclusively and the platform, but being Windows Phone developers who were bullish on the platform we snapped up the opportunity to get the backing of two huge tech giants, Microsoft and Nokia. With the support of Microsoft and Nokia, the app grew and, encouragingly, we immediately had requests for the app to be available on iPhone and Android. To us it was soon obvious that no social app could thrive on Windows Phone alone. By this stage, I was working alone on the app, having decided to pursue the now somewhat cliché career path of college dropout social media app founder (minus the part where I sold the company for a billion dollars) when George opted to go back to university. I took on contract work for three days a week building apps for Microsoft and Nokia, and continued building Foundbite at every opportunity outside this. This income gave the app a funding source and I was joined by Alfie Woodland, who worked with me from then onwards. Together, we began by improving the web experience (which exposed foundbites to users outside Windows Phone) and began work on our Android app. Our Windows Phone app had over 100,000 downloads and we had a pretty strong codebase using C# portable class libraries and an MVVM design pattern, as well as a .NET backend hosted on Azure. Rather than start from scratch building an Android app in Java, an unfamiliar language for both of us, we decided to use Xamarin and created a native Android UI with around 60% shared code between platforms. Being able to write a lot of the business logic once for two, and eventually three, apps was a boon. If you're interested, you can read more about our experiences on the Xamarin blog. More exciting developments were brewing whilst we were building the Android app. After being featured in an article about Sony Mobile's camera APIs I was contacted by their Xperia team, who went on to help us with testing devices and marketing support by giving us a featured slot in the camera app on every new Sony Xperia device. At this time we also secured funding from Bill Gross and the LA-based IdeaLab, both real icons of the US technology industry. The funding allowed me to stop contracting and join Alfie full time to begin working on launching an iOS version. Throughout the development the need to turn the app into a profitable business was on our minds, and those of many of the people we spoke to. We experimented with paid plans for extended features which 100+ of our most active users decided to pay for, but our end goal was to offer featured foundbite slots to businesses that might want to advertise a particular location. An example of this would be the London tourist board sharing the chimes of Big Ben with a picture of the houses of Parliament, which we could show to a user elsewhere looking around a map of the UK. For that to work we needed tens of thousands of eyes looking at the app every day - so with a small team we kept the focus on creating and honing a great experience that would get people to share the app with others. The Foundbite app running on Android, iOS and Windows Phone. Using Xamarin we were able to have a large amount of shared code. We also kept a similar user experience across all apps while keeping each in tune with the design patterns of each platform. Up to this point we'd been lucky enough to have the marketing support of some big names, Sony being the reason we decided to launch on Android before iOS. We'd benefited greatly from their help and they were a large driver of our early growth. When we launched our iOS app in 2016, we weren't so lucky forming a partnership and we struggled to gain traction in the App Store. Getting users who had originally used the app on Windows Phone and now used a different mobile OS (unfortunately very common for Microsoft and us) also proved far harder than we had expected. While the download figures were impressive, usage stats weren't telling the same story. We had a loyal group of heavy users who would upload multiple times a week and check the app almost every day. On the other hand, we saw many users who signed up to the app and only used it for a month before drifting away, despite enjoying the concept and the foundbites shared by others. In our research into this, many commented that they felt they had to be somewhere with interesting ambience in order to share and also wanted more users using the app (a typical chicken and egg problem). In retrospect, one of the challenges was the fact that Foundbite relied on users choosing the app rather than their phone's camera to quickly record an experience which could later be shared to Instagram, Twitter or Snapchat. Some people enjoyed the craft of composing a foundbite and carefully selecting sound to capture, but it made it harder for some to quickly post to their friends. We tried many different ways to increase usage of the app, but in March 2017 we had to make that hard decision to close it down. I pondered for quite some time, unsure whether to keep the service running for our core audience in the hope that one day it might explode in popularity as these things sometimes inexplicably seem to do, but I eventually decided it was time to take on a new challenge. As I mentioned in my post announcing the news, the world of mobile is very different now from when I first had the idea in 2012 and the world of technology moves incredibly quickly, as do people's attentions. Shutting down was a decision that certainly didn't come easily, but it was heart-warming how many people expressed their regret - sharing some of their favourite memories of using the app. It's incredible to hear that the app we built became a service that people really cared about and that encouraged them to listen to the sounds of the world around them in a way they hadn't before. As a creator, that's one of the best feelings imaginable. Just some of the comments we received after announcing that we would be closing the app down. I would be remiss not to thank everyone who worked with me and supported the idea: George Powell, Microsoft, Nokia, the University of Aalto and IdeaLab for believing in us and the idea. Also, to Alfie Woodland who worked alongside me for most of the journey and contributed so much. And finally, to all our users for giving it a go and uploading so many interesting sounds from so many places around the word - it was a truly spellbinding experience. If you want to hear more about Foundbite then here is a podcast I recorded in 2017 about the app and how we created it. I'm also planning to write a series of blog posts about all the things I learnt building the app in 2018.